Everything. And I mean EVERYTHING is up in the air right now. The short version is this: A move is happening. A surgery is not. For now. I was supposed to be laid up starting today, but now I will be up and at 'em. I had asked The Pie Queen to write a guest blog this week and she dutifully and deliciously baked and blogged. But since I'm on my feet, I shall save that for another time. When I really need it. Which might be tomorrow. Or it might be in a few weeks. It can be something for you to look forward to! I have precious few weeks of baking left in this kitchen before I temporarily move into the Pie Queen's kitchen. Where things are well-organized, but not mine. I hate to make a mess of someone else's place. So, I'm trying to pick recipes for those weeks that are less messy, less tool and ingredient specific, but not less delightful. This week: I'm baking scones. Using a recipe from Baking with Julia. I watched some of the series when it was on PBS (a lifetime ago) and loved it. Julia was a force to be reckoned with, that's certain. I'm not beyond doing my best Julia impression while I make these. 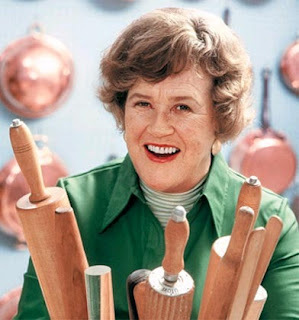 Note to self: Work on Julia Child impression. #2 ...with chocolate chips in it. And when I'm preheating the oven I smell something. And I open the oven to find leftover pancakes from last night's dinner. And what is in those pancakes? Chocolate chips. Of course. And what am I making to celebrate National Pie Day on Friday? Chocolate pie. My single-mindedness knows no bounds. #3 When did this happen to me, anyway? Today, I drove by Lehi Roller Mills and noticed they're having a sale on all 25 lb. bags of flour. Woo-hoo! (this is my brain on baking) I'm going in tomorrow to pick up All-Purpose, Strong Baking (bread) and Pastry. 6 months ago, I wouldn't even have glanced in that direction. And yeah, some strong man is going to have to lift those 25 lb. bags for me in the move. Sorry, honey. *I use (and love because it's SO simple) the Fannie Farmer recipe, which can be found here. Apparently it's one of Judy Hallman's favorite recipes too. *shrug* I occasionally (okay, always) replace the nuts with an equal amount of chocolate chips. I love pie. I would call myself a devotee. And I have my favorites among other desserts as well. But, the treat that really has my heart? The one that gave this once 13-year old girl something to focus on when friends were scarce and life was strange? The one that gives me comfort even now in turbulous times when a simple phone call can cause an otherwise calm day to become crazed and jangly? Cookies. Baking them and eating them. WITH MILK. Warm, crispy on the outside, chewy on the inside...cookies. Chocolate chip. Oatmeal. Chocolate crackle. If I can dip it in milk, somehow it makes life a little nicer and simpler. I'm old-fashioned that way. crunchy and delicious toasted nuts. I thought I was making the cookies a little bigger than they were supposed to be. But, the recipe said it should make 36, and I got 30 (unfortunately, I burnt 8 of those, I got distracted--too many irons in the fire--and forgot to set the timer). Now, I KNOW I ate more than 6 cookies worth of uncooked batter. Because it was that delicious. So, maybe mine were even a little bit on the small side. The dried cherries don't taste too cherry-ish. The cardamom isn't overpowering. All the tastes just combine into an unusual but still homey and delightful oatmeal cookie. Next up: Next Friday, January 23rd is National Pie Day!! (Not to be confused with Pi Day) So, naturally, I must make a pie! I'm trying a chocolate pudding pie (once again--seems like I failed at least a dozen times--what's that you say? I only tried it once? Well, then, once more won't hurt). I think everyone who reads these words should also make a pie that day. All...6 of you. Put lots of ice in a martini shaker. Use GOOD vodka in portions either 2 to 1 (vodka to syrup) or 3 to 1, depending on how sweet you like your cocktails and how much you like to be able to taste the booze in your booze. Shake like crazy. Strain into martini glass. Resist the urge to garnish this with a maraschino cherry. The syrup has a completely different flavor and they clash wildly. If you need a garnish, stick a lime wedge on the side. I'm not exaggerating AT ALL when I say this tastes just like cherry pie, except it has booze. My favorite! P.S. Cherry pie is beautiful! P.P.S. Prima thought the syrup smelled like cherry limeade. With a little more lime juice, you could certainly use this as a concentrate for that. Why pour that extra cherry juice down the drain when you can make something yummy with it? 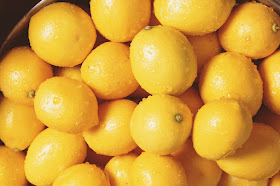 *A simple syrup will, if refrigerated, keep for several months. I don't know if the presence of juices (as opposed to water) would change that. Anyone? Sara Lee. Shame on you. For convincing the Western world that that block with your name on it in the freezer section of the grocery store is "Pound Cake". How did you do it? Did you fund a campaign to make it seem as though pound cake is difficult to make? Well, I'm onto you. I suppose in the days before electric mixers, this would, indeed, have been difficult to make. Take a pound of butter, beat it in an earthen pan, with your hand one way, till it is like a fine thick cream; then have ready twelve eggs, but half the whites, beat them well, and beat them up with the butter, a pound of flour beat in it, and a pound of sugar, and a few caraways; beat it all well together for an hour with your hand, or a great wooden spoon. Butter a pan, and put it in and bake it an hour in a quick oven. You did notice that said to beat it all together "for an hour with your hand", right?! Fortunately, I am a liberated and MIXERated woman, so this was one of the easiest cakes I've ever made. Beautiful batter. I had read here and there that the old-fashioned pound cake recipe (which doesn't include baking powder) doesn't rise sufficiently and would end up as a dense brick. That wasn't my experience at all. Mine rose very nicely. And came out with a crunchy crusty outside and tender inside. If I'm being honest, it's a teensy bit dry. I think I may have overcooked it -->this<-- much. It seemed gooey when I first tested its doneness. So gooey, that I set the timer for another 10 minutes. 2 minutes probably would have done the trick. However, I'm already thinking of a myriad of things to put on top that will moisten the cake: ice cream, whipped cream, a splash of coconut rum, mashed berries. The mind boggles. It's a perfect base for adding whatever a person likes. And it's also lovely by itself. It is buttery and yes, rich, but not dense or heavy. It tastes fresh and flavorful (and none of the flavors are "freezer" or "aluminum pan"). TGIP Rating--Pound Cake--KEEPER--This old-fashioned recipe doesn't need any modernizing, IMO (but I do need to watch the cooking time). Next up: Let's see...pie, bread, cake...I think I'll try a new take on an old-fashioned cookie. A recipe from Baked, which I received as a Christmas present. Oatmeal Cherry Nut Cookies. I couldn't wait until midweek to post this. It came to my door yesterday (a late Christmas present from my adored mr.). Look! It's on my very own kitchen counter! Isn't it the most beautiful thing?! It is almost exactly the same color as the inside of cherry pie. Which means...I can't resist making cherry pie this week. Pound Cake be damned. Or maybe I'll make both. If I do, Pie Queen and Quilter, you're getting desserts this weekend. Legend has it that this bread gets its name from a man cursing his wife, who feeds him only a porridge of cornmeal and molasses. One day he decides to make it into something different, adds flour and yeast, and mutters "Anna, damn her!" while kneading the resultant mass into bread. Supposedly, it's commonly found in New England, but not in these parts, although I know I've seen it in the bakeries of various gourmet supermarkets and health food stores both here in Utah and in California. And I'm certain I've eaten it before. Perhaps I need to remember in which supermarkets I've seen it and resolve to buy this bread, not make it myself. It's a delicious bread (if memory serves). And unusual. Cornmeal, molasses, whole wheat flour, white bread flour. Very unusual. And not as easy to make as one would think. I'm not sure if it was me, my ingredients, or the recipe I used, but I have never had such problems with bread. Now, I'm no bread expert. But I have made my fair share of breads. This one was virtually impossible to knead. It just didn't seem to have enough liquids to accomodate the 6-1/2 cups of flour that went in. And it never really rose like it should have. I started out by boiling together 2-1/2 cups of water, 1/4 cup of molasses, 2 tablespoons of butter and 1/2 cup of cornmeal. That seemed like a good amount of liquid. But as it cooled to lukewarm (as the recipe suggested), the cornmeal absorbed the liquid and it congealed into something less liquid-y. So lacking in the liquids, in fact, that after I mixed in the yeast, 2 tablespoons of warm water and the whole wheat flour, I decided it would be impossible to stir in the bread flour and that I would have to work it in 1 cup at a time on the counter surface. But I faithfully attempted to work all that flour in. And kneaded for 15 minutes according to the recipe. And just about worked my shoulder out of its socket in the process. Rock bread. That's what Prima thought would be a good name for this bread. That was pretty much the density of it. Smelled delicious. But did not turn out right. At all. A mystery to be solved. 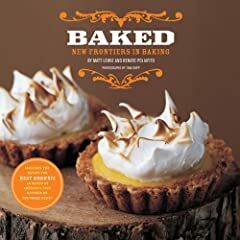 I need to get serious about reading my food science books and I think I may need to get a real bread baking book as well. Suggestions? About what went wrong here or books I should look at? TGIP Rating--Anadama Bread--"Anna, damn her!" indeed. Find a new recipe. Or something. Why is it that with every other pie I can title the post "Fresh Raspberry" or "Spiced Pumpkin", but I can't call this one "Chicken Pot"? Just doesn't work without the "Pie" at the end. But, boy does this pie work. If it were easier to make, mr. and I would both gain 50 pounds this year. Because I would make it once a week. Thankfully, it's a time consuming process. But so worth it. It was nice to be back to making a regular pie crust. It seemed like weeks...which I guess it literally has been. I went to Lehi Roller Mills last week and stocked up on their Peacock All-Purpose Flour for general baking and Pastry Flour for pie dough. Their products aren't organic, but they are local and high quality (and I know the owners through my parents, so it kind of feels like buying from a neighbor). I can feel the difference as I work bread dough and pie dough with my hands. This flour is so much more fine and soft. I love it. This pie. Was delicious. I don't know if I've ever had homemade pot pie. In fact, I don't think I've ever had anything but frozen pot pie. There's a world of difference. I don't think mr. has ever been so excited about food. The onions give a wonderful flavor. The vegetables are cooked, but still have some texture and aren't mushy (the potatoes need to be cut to the same size dice as the carrots--mine were bigger, they weren't raw by any means, but they were slightly undercooked). The sauce is creamy but not too thick. It served up so nicely. I was sure that once I cut into it and removed a piece, the liquid would flow everywhere and it would be an impossible mess. Not at all. There's so much meat and vegetables in there that it really holds together. Some of the sauce leaks here and there, but that's part of the point with pot pie, right? I'm looking forward to trying this with leftover turkey from Thanksgiving. That may, in fact, be the next time I make this recipe. For the sake of my waistline. It was a perfect winter meal. In the sticks-to-your-ribs way. I topped it off by making pie dough cookies from the leftover dough. The Pie Queen used to do this when we were kids, but I had forgotten about it until The Piper's daughter reminded me around Thanksgiving. They had made some (just roll out the dough, cut it into rounds with a biscuit cutter and bake at 425 for 10-15 minutes) and sprinkled them with cinnamon sugar. I had to give that a try. With vanilla ice cream. So delicious. Like a flat churro. Other baking projects this week: No-Knead French Bread, Banana Chocolate Chip Mini Muffins, and Cream Biscuits (which I neglected to photograph, but they were easily one of the more delicious things I've ever baked). Next up: I realize I may have bitten off more than I can chew, switching my focus off pie and onto general baking. It leaves me with not just a world, but a universe of possibilities to choose from. I've discovered that The Joy of Cooking (I have the 1997 edition) is a great source for ideas for old-fashioned recipes. But in the edition I own, they've already done some of my work for me, they've altered the recipes to suit modern tastes. Meh. I want to try a real old-fashioned Pound Cake. With ingredients measured by the pound. Oh yeah. This should be interesting.